When the layering of these disparate elements, ‘c’ ‘g’ ‘n’ ‘m’, individually begins to swell, these overlapping tones take on dimensionality, forming the collisions of letters amongst ebbing and flowing phrases. Not quite forming words, this phrasal layering allows the sound to take on lateral movement, as though one were traveling through a stack of maps rather than across a cartographic surface. This environmental soundscape, which feels simultaneously personal and celestial, is Lakshmi Ramgopal’s installation “A Half Light Chorus” at the Lincoln Park Conservatory as part of Experimental Sound Studio’s Florasonic series. "Clarinetist Jeremiah Cymerman channels his improvisational ethos into dark, turbulent directions"
New York clarinetist and sound artist Jeremiah Cymerman has developed a multipronged artistic practice over the years, working his mixture of improvisational exploration and pure sound into a variety of disparate projects. "British soprano Juliet Fraser brings haunting fragility and intimacy to her first Chicago solo performance"
I haven’t heard most of this weekend’s program, but based on the works I do know, it promises more of that fragility and sympathetic intimacy. Lawrence Dunn’s “While We Are Both” calls for a serene reading of poetic text, while in Eleanor Cully’s “I, as Mouth” barely audible vocals are fed into transducers, triggering the surfaces of various resonant objects; the program also includes work by Cassandra Miller and Christopher Butterfield, two stunning Canadian composers. "Review: Experimental Sound Studio offers another Option for devotees"
A lone musician stepped to the front of the room, brought his traditional Japanese flute to his lips and began crafting mystical sounds. Pitches bent flat and sharp, notes wafted gently into the ether, melodies dipped and rose and changed course without warning. Though it was standing-room-only Monday night at Experimental Sound Studio on North Ravenswood Avenue, the house was silent but for the sound of Ned Rothenberg's art. True, the room was rather small, seating about three dozen people. Still, performers dream of this kind of setting: raptly attentive audience, exquisite acoustics, no artistic compromises asked for or given. The occasion was significant because ESS' Option series, which went on hiatus toward the end of last year, was bouncing back into action. As always, the event would feature two parts: a performance followed by a conversation, both unfolding in an unusual setting. For the event was taking place in a recording studio, the warmth and vibrancy of the room closer to a concert hall than a club, but more intimate than either. MW: And has that been influenced by your work at places like Experimental Sound Studios (ESS)? I know they’ve gone through a transition recently losing their founder. AM: Yes! Lou Mallozzi. I had put in a proposal with them. I had the pleasure of meeting Lou and having him critique my work about a year and a half ago at ACRE. That was a really great experience. I got the chance to communicate and talk with him. Then, my first major performance within that form was at ESS. Before that, I was in Dekalb at NIU, so I did a lot of my work there. I had a studio there and the transition for me was sculptural. I was experimenting with everything, so when I started doing sound, it opened up this gigantic world and I didn’t know but as I was moving through it step by step. I was in a space of sound. It is the most natural thing for me and my work. I knew that ESS was where I wanted to go, and I was very lucky to get accepted. The performance was amazing. I totally intend to record there more–as often as possible. Photos by Dan Mohr of Moon Bros. performing at ESS's Option and Summersonic series. "Vandermark, Marsalis, Pickens head up big Thanksgiving weekend in jazz"
For the past year and a half, listeners have been convening at Experimental Sound Studio for a groundbreaking Monday-night series called Option. Innovators such as Ari Brown, Paul Lytton, Joe McPhee, William Parker and others have performed in close quarters, often discussing their music afterward. The series went on hiatus last month in search of new financial support, and this special concert will serve as a fundraiser and prelude to the next season, which is expected to begin in March. "From the start," writes Vandermark in an email from Europe, "the Option programmers — Tim Daisy, Andrew Clinkman and I — wanted to create a different approach to the concerts, adding musicians' interviews to many of the performances. … The intimacy and sound of the Experimental Sound Studio provides a unique environment for the musicians and audiences alike. How often can a listener sit five feet away from an artist like William Parker while he plays a solo recital and then, later, as he talks about his creative history?" In addition, the events are live-streamed, recorded and archived for future research. "The goal," adds Vandermark, "is to make history and document it, one step at a time." To celebrate the forthcoming resumption of Option, the series will present bassist Revis in a solo set, pianist Davis and reedist Vandermark in a duo." "Top V. Weekend Picks (9/29–10/5)"
"JK: At ESS we experimented with recording methodology, and listening to the differences between recording real vintage instruments and their emulations. The recordings involved music that was being written at the time. The showcase was presented as a disintegrated performance across multiple speakers and speaker types placed inside and outside [the performance area]. Since the residency some songs have evolved and new ones have formed. They’ve taken on new performance techniques and approaches to fold physical materials back in, such as copper, acrylic, brass, and concrete. We began placing voices and text. The music has become more simultaneous, heterogeneous and dreamlike." "Simulation celebrate a new tape at ESS’s Summersonic festival"
"According to their Bandcamp page, Simulation resulted from a "paranormal visitation" Johnson and Callier had in Forsyth, Montana, during a tour together—maybe that's why Nalumbanet sounds like some of the spookiest Friday the 13th dub ever recorded? On Saturday they'll celebrate their new tape at Experimental Sound Studio's daylong Summersonic concert, which also includes Homme, Melina Ausikaitis, Avery Young, and others." "Live from Studio 435: Avery R. Young"
"The tremendously talented Avery R. Young joins Justin in Studio 435 to talk about his career, growing up singing in church, being a part of the poetry community, making music in Chicago, his experience playing with a band, developing his sound, being invested in the language as opposed to the groove and the process of making new music. Avery and de deacon board also treat us to a couple of songs including “Lament” and “Preach."" "BLG: We recorded anyway and anywhere we could on our music making instruments. We shared compositional and arrangement ideas via email and also face-to-face in the lab (anywhere a laptop and microphone could fit: kitchens, Niteroi beach houses, etc.) whenever we were in the other person’s city. I entered the session with songs written beforehand for this project most definitely. We mixed the bundle of sound with the fabulous Alex Inglizian of Experimental Sound Studio." "Versatile percussionist Chris Corsano plays a rare solo show Monday"
"Drummer Chris Corsano has plenty of steady partnerships, whether it's in his various groupings with the fire-breathing western Massachusetts saxophonist Paul Flaherty, the Arabic-infused free-rock trio Rangda, or Vampire Belt, his splattery noise project with guitarist Bill Nace. But in a broader sense I think of him as a free agent, an improviser who ignores all boundaries and limitations and seems game for any challenge—playing and touring with Bjork or going head-to-head with the legendary British saxophonist Evan Parker. He's a busy guy who crisscrosses the country—and the world, really—with consistent gigs in countless contexts. On Monday he rolls into town for a solo performance as part of ESS's Option series, followed by a conversation with fellow percussionist Tim Daisy about his work." "Ushering in a New Era and New Opportunities at Experimental Sound Studio"
"When faced with Lou’s imminent departure, the staff and board of ESS decided against the obvious course of action—hiring a new Exutive Director to assume Lou’s duties. Instead, we have developed a carefully calculated plan to redistribute his duties to the existing staff, who have begun to run the organization according a non-hierarchical, consensus-based model of our own design. (For more on this transition and the history of ESS, read Peter Margasak’s feature on ESS in a recent issue of the Chicago Reader.)" "In 2001, Experimental Sound Studio began its Florasonic series in partnership with the Chicago Parks District’s Lincoln Park Conservatory. The project asks artists to create multi-channel sound installations for the Fern Room at the Conservatory. Since its inception, the series has showcased the work of 39 artists to an estimated audience of 500-1000 people daily, and is the only program of its kind in the US. The current exhibition, percussionist and composer Tim Daisy’s The Glass House, is a subtle work that contemplates the architecture of the Conservatory itself. The piece, composed for vibraphone, cymbals, radio, and vintage turntables, is structured as four independent sections of different duration that play simultaneously from the four speakers in the Fern Room, guaranteeing a unique experience for each visitor. In conjunction with the exhibition, Daisy released this fixed version of The Glass House on his own Relay Recordings imprint for streaming and download." "Jaap Blonk, Fred Lonberg-Holm, and Tim Daisy; Chris Brown"
"Pianist and electronic musician Chris Brown opens; the trio headlines. Blonk will also perform as part of the Experimental Sound Studio Gala on Sat 7/2. "Hal Rammel, Ken Vandermark, Olivia Block, Michael Zerang, Jaap Blonk"
"Though tonight’s extravaganza is organized to fete both the 30th anniversary of Experimental Sound Studio and the departure of executive director Lou Mallozzi, there’s another anniversary lurking in the background. Celebrated improvisational musicians saxophonist Ken Vandermark, sound artist Olivia Block, percussionist Michael Zerang, and vocalist Jaap Blonk will all perform tonight; lesser known is Milwaukee veteran instrument maker Hal Rammel, whose best-recognized creation, the amplified palette—a painter’s palette fitted with a contact mike and a series of beautifully arranged wooden and metal rods played with mallets, bows, and other objects—recently turned 25." "One way veteran improvisers can prevent predictability is to keep their ears open to younger generations. That’s certainly a discipline that’s made Bay Area clarinetist Ben Goldberg one of the most consistently rewarding players of the last few decades." "When we prepare for a performance and while we are playing we are in a state of immediate encounter and engagement. Each time we do a performance or project it feels very new. Some of the materials are invariably the same but we always build something different. I think we’re very excited to be together, for the periods time our schedule allows, exploring sound, in front of an audience, and to have the gift of the ESS space. We would really love the opportunity to play more." "Review: Spektral Quartet on 5/6 at Experimental Sound Studio"
"It occurs to me that a concert program is also a collection of miniatures. Any given program is potentially a formal cop-out—unless it’s not. On Friday, May 6, Spektral Quartet played a show on the Outer Ear Series at Experimental Sound Studio. The program comprised four pieces: Arvo Pärt’s Fratres, Mikel Kuehn’s Quartet No. 1, Hans Thomalla’s Bagatellen, and the last movement of Mendelssohn’s Quartet No. 1. Spektral commissioned both the Kuehn and the Thomalla, and premiered both very recently—the Kuehn just days before Friday’s show, and Hans’s piece earlier in the season. Spektral performed a similar program minus Mikel’s quartet at Fulton Recital Hall at the University of Chicago on Saturday, May 7. They’ll repeat that show on Friday, May 13 at Nichols Concert Hall in Evanston. Outer Ear is an annual live performance series offered by ESS. See the two remaining programs on the series May 20 and June 10. "How will ESS replace Lou Mallozzi?" "For its three decades and counting as a vital outlet for the sonic arts in Chicago, Experimental Sound Studio has been synonymous with artist Lou Mallozzi, who founded it in 1986 with his first wife, Dawn Mallozzi, who died of cancer in August 1999. They ran it together from its inception till her death, with Lou as associate director and Dawn as executive director, and since then he's served as executive director himself. This summer, though, he's stepping down, letting go of the reins at a crucial institution he's spent 30 years nurturing—though after a six-month sabbatical, he'll return at the start of 2017 as a board member with title of director emeritus. Formed before Chicago had a coherent sound-art community, ESS began by serving a variety of artists from different milieus united by their interest in experimenting with sound, either as a primary or secondary focus. Performance artists such as Lynn Book, Lawrence Steger, and Brigid Murphy used its recording studio, as did poets such as David Hernandez and Carlos Cumpian. Naturally, many of the city's important experimental musicians got involved with ESS very early on, including Michael Zerang, Gene Coleman, Douglas Ewart, Laurie Lee Moses, and Jeff Kowalkowski. ESS also partnered with important cultural presenters, among them Lower Links and Randolph Street Gallery. Internationally renowned artists who performed under the aegis of ESS in those years included the likes of Nicolas Collins, George Lewis, and Elliott Sharp. ESS is a nonprofit, and it not only offers affordable rates to artists interested in using the studio as a tool but also accommodates unusual techniques and ideas. A 1999 Reader story about Dawn mentioned a few, including "arranging microphones in buckets of water or rolling dice to decide how to set up the mixing board." During its 30-year history, ESS has grown into a multitiered institution, and while its recording facilities remain central to its mission, it also organizes classes in studio practices, provides artist residencies, and houses the steadily expanding Creative Audio Archive—whose historically important collections include the myriad show recordings of activist Malachi Ritscher, a trove of material from Sun Ra and El Saturn Records, and recordings from the Links Hall concert series curated by Zerang." On last year’s remarkable Solos Bimhuis (Relative Pitch) he manipulates his acoustic guitar to sound like a variety of traditional African instruments—whether a kalimba or a riti, the African single-string instrument after which he named his label—by masterfully generating a rasping buzz through pick manipulation. His solos sometimes reflect his skill at long, spindly single-note flurries, but the most exciting passages convey a fingerstyle-like multilinearity as tangles of notes pile up in knotted bunches." "Once a regular collaborator of cellist Fred Lonberg-Holm, Attias doesn’t make it to town often, and though he’s never performed solo here before, he’ll be doing just that tonight on alto sax and piano. The performance is part of Experimental Sound Studio’s weekly “Option” series and will be followed by a discussion with percussionist Tim Daisy." "Still, the best material is his own, where lines unfurl like molasses dripping down the side of a jar, or move in fat, swerving double stops spiked with bracing harmonies, each utterance carrying the weight of an orchestra. The concert will be followed by a discussion between Maneri and Ken Vandermark." "Ken Vandermark celebrates his latest project with a solo concert "
"But thankfully, Vandermark hasn't retreated entirely. He's one of three programmers—along with Tim Daisy and Andrew Clinkman—behind the weekly Option concert series at Experimental Sound Studio, and he continues to share his music through his own Audiographic label." "Inspired by voice artists like Jaap Blonk and Joan La Barbara, Yeh trusts in what his untreated voice can do, from blubbery lip-flapping excursions that suggest a puttering motorboat to spittle-flecked violence that sounds more like a distressed radiator valve than a human. Elsewhere there are flurries of lip-smacked or chomplike percussives, as well as throaty hums interrupted by glottal stops (or self-inflicted strikes to his throat) that sound like a motor refusing to turn over. Yeh will perform the music from the album in its entirety." "Jefferson Pinder show an exhibition for Black Lives Matter movement"
"Boardman's last solo show, held in May at the Experimental Sound Studio in Ravenswood, foreshadowed her death from metastatic breast cancer with insistent radiance and unsettling honesty. Her knowing optimism and acceptance of human frailty infused that exhibition, as it had so many earlier projects and ones left unfinished at her death.'" "Calling all #Bertoia fans in the Chicago area! A phenomenal opportunity to experience #HarryBertoia’s monolithic sonambient sculptures: 'Experimental Sound Studio (ESS), in collaboration with artist Olivia Block, presents “Sonambient Pavilion”, a sound installation using the 50-channel sound system of the Pritzker Pavilion at Millennium Park.'" "The "Sonambient Pavilion" installation transmits and manipulates Harry Bertoia's sound sculptures into 50 loudspeakers at Millennium Park." "Experimental Sound Studio (ESS) proposes to commission, organize, produce, and present "Sonambient Pavilion", a sound installation using the 50-channel sound system of the Pritzker Pavilion at Millennium Park in Chicago, Illinois. The project is an homage, a response, and a re-activation of the two sonambient sound sculptures by Harry Bertoia (1915-1978), located in Aon Plaza across the street from the Pritzker Pavilion in downtown Chicago. Olivia Block, a highly respected Chicago composer and sound artist who performs and exhibits internationally, initiated the project with ESS during her substantive research into the Bertoia sculptures, and will be the project's lead artist." 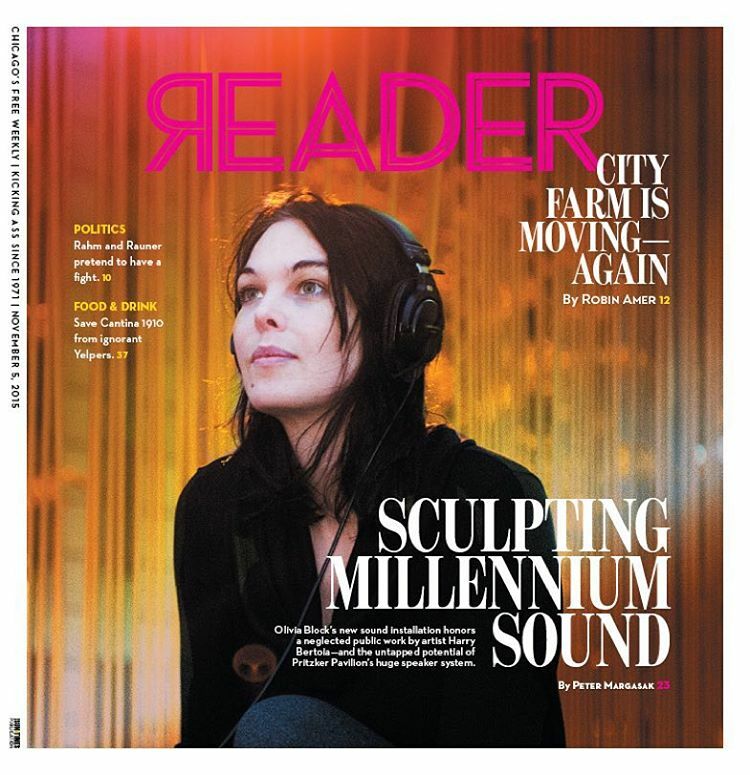 "Olivia Block Installs a "Sonambient Pavilion" in Millennium Park"
"Block sourced the sounds for her Sonambient Pavilion from the Bertoia sculpture, and is expanding the limits of the Pritzker Pavilion's sound system for her installation. SAIC faculty member and Experimental Sound Studio founder Lou Mallozzi helped Block propose the work for the Biennial and realize it for the Millennium Park bandshell. Talking about the sound system, he says, 'The upgrade is significant. It moves us from working in a surroud-sound lateral format...to spatializing sounds above the listener as well, creating a monumental enveloping effect.'" "Turning Pritzker Pavilion into a second kind of art"
"'This is what we do at ESS,' says Mallozzi. 'We create partnerships in the community in order to give artists more opportunities to explore their work in new contexts, and to give audiences increased access to innovative cultural work.'" "New York saxophonist Ingrid Laubrock plays Experimental Sound Studio on Monday"
"On Monday saxophonist Ingrid Laubrock and drummer Andrew Drury will perform at Experimental Sound Studio as part of the weekly Option series—the latter's quartet Content Provider, with Laubrock, fellow saxophonist Briggan Krauss, and guitarist Brandon Seabrook, played Edgefest on Thursday." "Thin Hymns is in flux, which is good"
"Last year the Experimental Sound Studio and Chicago Film Archives produced a pair of encounters that involved two previously unacquainted musicians collaborating to devise scores for sequences of short films. Dubbed Kinosonik, the experiment went so well that this year there will be three more programs. Tonight, “Kinosonik #3: Industry, Cities, Design & Experimentation” brings together representatives of the forward-thinking Association for the Advancement of Creative Musicians and the city’s contemporary experimental-music community, pairing woodwinds and didgeridoo player Mwata Bowden, a longtime AACM member, with Coppice, a harmonium and electronics duo." "Spirit Writing, Toupee, Moon Bros."
"I can’t tell what this new partnership between Milwaukee percussionist Jon Mueller (Death Blues) and Chicago electronicist Jaime Fennelly (Mind Over Mirrors) will sound like, and according to the answers each musician gave me, neither can they. Based on past work from both, including the instrumentation they’ve used (harmonium, synthesizers, drums, voice), I’d bet on a beguiling mix of drones with quietly rippling melodies and ecstatic energy." "Johannes Bauer, Paul Lytton, and Jason Adasiewicz"
"Thanks to the seventh iteration of Milwaukee’s Okka Fest, an annual extravaganza of top-notch free improvisation (6/5-6/7), we’ll again get some spillover from a lineup built by Bruno Johnson, proprietor of the titular record label Okka Disc. Following a rare solo performance here last week, drummer Paul Lytton is back for another gig, this time with veteran German trombonist Johannes Bauer." "Thalia Hall's Garage Hosts A Minifest . . . In A Maze"
"Finding a space was key to getting the maze here, and that issue solved itself when Thalia Hall opened last year; the garage beneath the concert hall sat unused till organizers started setting up the maze. Heyl tapped Experimental Sound Studio, experimental label Hausu Mountain, underground music site AdHoc, and a handful of others to put together a lineup for one of the 11 nights of the festival." "The same cannot be said for Deborah Boardman's solo installation of a canopied bed, geometric paintings and bright banners at Experimental Sound Studio in Ravenswood. The artist's diagnosis of metastatic breast cancer is right there, hand-lettered on a pair of bed pillows fluffed up in the center of the gallery. DUCTAL, CARCINOMA, METASTASIS and their ilk are terrifying words, all the more so because they are doctor's lingo, clinical terminology that reduces a complex being to a diseased body." "This rare solo performance kicks off a new weekly series at Experimental Sound Studio called Option, organized by reedist Ken Vandermark, drummer Tim Daisy, and guitarist Andrew Clinkman; after Lytton plays, he’ll sit down for a conversation with Vandermark." "Florasonic In Bloom At Lincoln Park Conservatory"
"Anyone who has visited the Lincoln Park Conservatory has probably noticed there’s a lot to be seen and heard. Since 2002, the Experimental Sound Studio has been curating Florasonic, a program that commissions composers and artists to make new site-specific music and audio art installations in the conservatory’s Fern Room." "The Bridge Brings More Great French Improvisers To Town This Week"
"The Bridge #1, also known as Sonic Communion, will perform a free concert at Black Cinema House on Monday and will also play two full sets next Thursday, May 7, at Elastic and another next Friday, May 8, at Experimental Sound Studio. Bridge #8 will play Tuesday at the Whistler. " "Mivos Quartet And Patrick Higgins Join Forces Tonight At Experimental Sound Studio"
"Because I've presented a couple of concerts by them in Chicago over the last year (including one this past Sunday at Constellation), I haven't really had the chance to proclaim my adoration for the remarkable New York string ensemble Mivos Quartet, a fearless, precise, and forward-looking new-music group dedicated to some of the toughest material being written today. But I'm pleased as hell to watch them play, strictly as a listener, tonight when they perform an intimate concert at Experimental Sound Studio, the local premiere of the third string quartet by composer Patrick Higgins." "Isabelle Duthoit & Franz Hautzinger"
"Duthoit appears to consider her voice and clarinet inextricably linked tools of expression that achieve the same effects—she might shoot vocalic utterances through her reed instrument or make it flutter, whisper, and whine like a human’s most basic articulation. And she’s found a good partner in Austrian trumpeter Franz Hautzinger, another radical improviser who’s made his reputation shrugging off conventional tone in favor of unpitched columns of air, close-miked valve clacking, and exquisite manipulations of his mouthpiece that forge a subtle variety in timbre." "Exhibition Review: Remote Central: Future Force Geo Speculators"
"When viewing Remote Central, the recent exhibition by the collaborative Future Force Geo Speculators (FFGS), one enters a time warp, a kind of future-past in which the artistic and political strategies of the historical left are recast in a Sci-Fi aesthetic to reimagine a more perfect present. Hardline feminism and cottage-industry craft, in particular textiles, are employed or rather deployed throughout the works on view, installed en masse to emulate a makeshift agora or meeting space that exists in a not-so-distant future." "Experimental Sound Studio In Ravenswood Broadens Definition Of Art"
"As its name suggests, ESS, at 5925 N. Ravenswood Ave., is focused on sound as an artistic medium, in addition to its operation as a recording studio. Many musicians pass through its doors weekly, said director of marketing and public relations Dan Mohr, but the sound technicians are considered true artists as well." "Chicago: the Ancient future-music of sam scranton"
"The premiere of Sam Scranton‘s Detritivore, presented in the tucked-away space of Experimental Sound Studio, felt like a major art event. It is an evening-length ensemble work that is both theatrical and restrained, simultaneously epic and intimate, and was so absorbing that I could not write about it without participating in the reverberations of the piece itself." "Reader's Agenda Tue 4/8: Florasonic, Maria Gaspar, And The Amazing Catfish"
"Each year the Experimental Sound Studio commissions sound artists to write new pieces specifically designed for the Lincoln Park Conservatory's Fern Room. Florasonic aims to reflect the natural mood and attributes of the conservatory and its plants. This month you'll hear a piece by Hal Rammel composed on his sound palette, a custom instrument he designed in the 90s." "On Sunday at 3 PM, Experimental Sound Studio will hold a free opening reception for the installation Divinitusssanimalusssacréusssor­ganusss, for electric keyboards and stuffed toys." "Best Concert Series in a Recording Studio"
"Though the 425-square-foot space seats just a few dozen, the sound quality is as lovely as you'd expect from a room where people record—the intimate gatherings of fans who attend these concerts bask in rich sonic detail, and most folks sit within ten or 15 feet of the performer." "Columbia College represents at 2014 Whitney Biennial"
"Fischer’s complete presentation includes borrowing a number of items from the Creative Audio Archive at Experimental Sound Studio in Chicago, including concert posters that belonged to Ritscher, and 8 briefcases he owned that were filled with cassettes and DAT tapes at the time of his death. Fischer will also offer free copies of an essay that he wrote profiling Ritscher’s career success and his personal connection to him." "Hours of Malachi Ritscher’s recordings, preserved and archived by Creative Audio Archive at Chicago’s Experimental Sound Studio, are accessible via a listening station at the 2014 Biennial. They are included alongside other artifacts from his life and a free offset publication by Public Collectors." "Chronicles of Continuing Education: Other Music Lessons"
"If experimental music and sound piques your curiosity in any way, then Ravenswood’s Experimental Sound Studio is one of the best venues in the city to learn more, whether through a formal class or just hanging out at a jam session or live recording. The non-profit studio occasionally teaches workshops in circuit bending, audio mixing and mastering, and more. It’s also a cool place to check out performances from new and established experimental musicians and sound artists." "Air on the Edges: Alumni duo Coppice breathes life into Chicago’s experimental sound scene." "Still, the most captivating element of Coppice’s work is the role of breath, evident in the Fern Room experience. It is present in both obvious ways (the "breathing” of bellow instruments) and in the subtleties of rhythm and intensity. Kramer explains, 'Air is rarely a sonic material on its own. It’s really about the air and the edges; the things that get in the way of the air. Performing gestures with those edges is a big part of how air works. We also think about the time scale of air and how it relates to the human body—making compositions that relate to the time scales of the breaths that we take.'" "At ‘Prairie’ and ‘Orniphonica 2,’ [sic] Machines Make Nature Sound Awesome"
“Friday: Benefit at ESS for drummer Frank Rosaly"
Chicago-based contemplative experimentalists Pillars and Tongues will be playing a special, intimate performance at Experimental Sound Studio for its Outer Ear Fall Series. “In the Midst of Life: a Requiem at the Lincoln Park Conservatory"